Good morning girls :). Thank you all so much for your comments and emails on yesterday’s post. You girls are the best… I’m so glad that many of you were able to relate. Today I am going to share yesterday’s eats with you, along with what we did through the day. Marco is off (for now) on Monday’s, and I do only office work. I meet with my clients Tuesday through Thursday. I have a couple of “IE (Intuitive Eating) notes” for you as well.. So if you’re interested in reading through the mindset of what IE feels like (simply, just listening to what your body is telling you) then read on… Again, the purpose of today’s post is to show you that you can feel great in your body without counting calories, diets, or deprivation. Your body is the best tool you have. 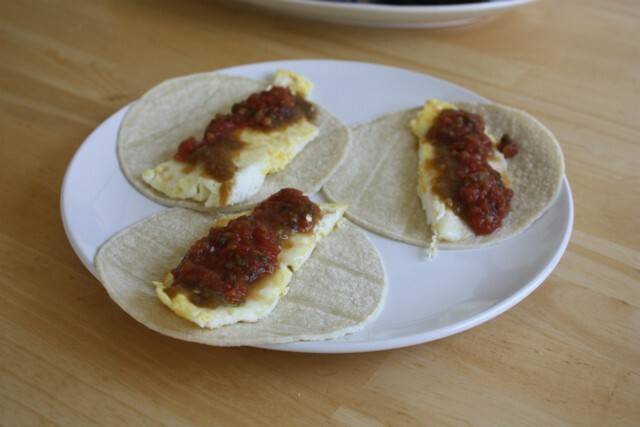 Yesterday morning started with eggs, cheese, salsa, and corn tortillas. IE note: actually, the morning started with quiet time, blogging, coffee, making Marco breakfast, and then making myself breakfast a little while later. I wasn’t hungry for a while yesterday morning, and since I didn’t have to leave the house or jump on the phone with clients right away, I waited for my hunger to show up. 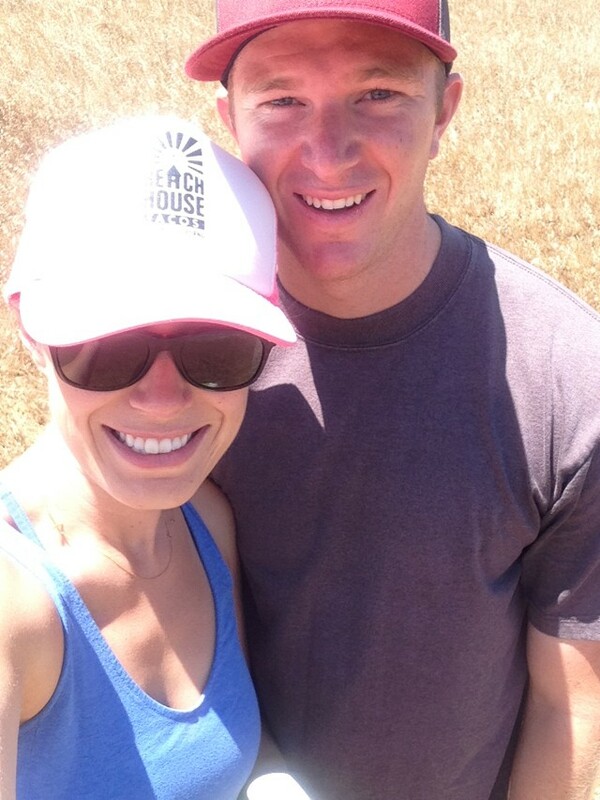 After I ate breakfast, finished work, and Marco finished at the gym, we went for a hike. The hike was so beautiful, and almost two hours. It looked over SLO entirely. If you live here, it’s Madonna that we hiked. Once our feet hit home we sat for a moment, and then opened up the garage and did our planned clean up. We’ve only lived in SLO for about eight months, and we’re only two people, so we don’t have much, but still wanted to organize the garage. We’re hoping to make it a fun little hangout spot. Sounds fun, right? When we were done with the garage (probably took less than an hour) we showered, I did a bit more work, and then we walked to chipotle for lunch. It was pretty funny… As we were walking home from our hike Marco let out a bit “Mmmmmmmm, Chipotle….” and when we arrived home, we checked the mail and there was a buy one get one free at Chipotle coupon. So naturally, we went to lunch there. The coolest part? They give you the cheaper one free! The guy working told M he could get guac, double meat, etc… whatever he wanted and we’d still pay for the cheaper one. He wasn’t just being nice to us either, that really is the rule. Wow! Lucky me, I got the more expensive one as M didn’t want guac or double meat. I got free guac :). You guys should check your area! Do a quick google search of “buy one get one free at Chipotle” and see if you can get the coupon in your area! Pretty sweet… Let me know if they’re doing this where you are too. Oh, and my bowl was SO GOOD yesterday. 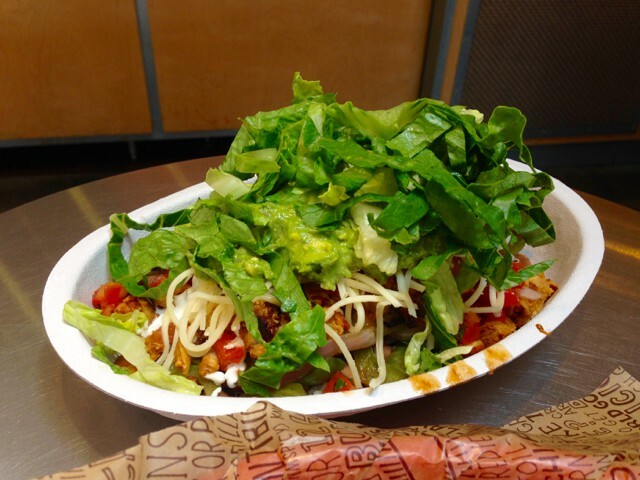 Inside: brown rice, pinto beans, veggies, chicken, mild salsa, a little cheese and sour cream, guac, and lettuce. Yum! Again soon, please? After lunch, we headed to Bed Bath & Beyond. We still have gift-cards from our wedding (it’s almost been a year – crazy, right?! ), and are trying to use them up (haha!). Unfortunately, they didn’t have anything we could use to organize the garage, so we continued our journey and are going to leave the garage be for a moment. Around 6:00 Marco and I got in our PJ’s and sat down to watch American Sniper. Neither of us were hungry or feeling dinner. So, I made a chocolate peanut butter shake and Marco snacked on chips and my Dad’s salsa while we watched the movie. I had a handful of tortilla chips & salsa, too. IE note: normally, I don’t skip meals because it usually leaves me feeling unsatisfied, but last night, I was really not feeling dinner. I was so satisfied from our yummy lunch at Chipotle and all I wanted was a yummy, rich, PB/chocolate smoothie, and since M wasn’t hungry either, I was all for not cooking. 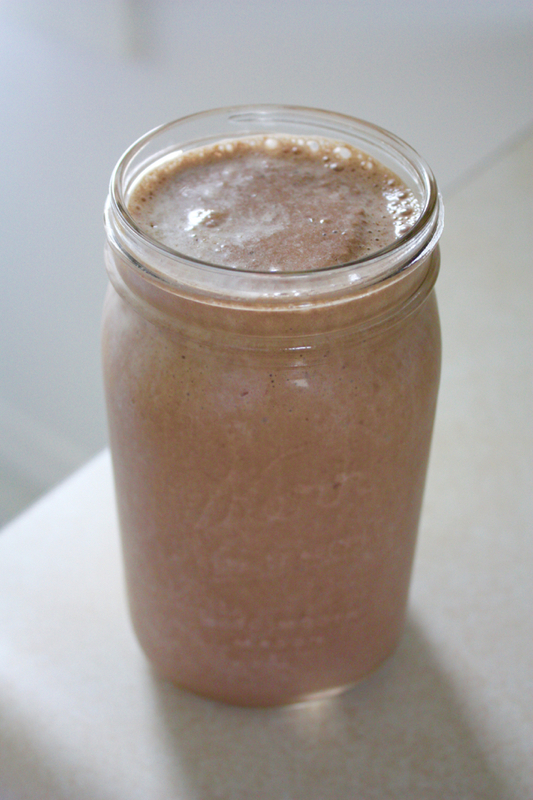 In my smoothie: two frozen banana’s, a good sized spoonful of peanut butter (peanuts only), two spoonfuls of raw cacao, one big spoonful of flaxseed meal, and half whole milk and half soy milk (was just using what we had left of the soy). You can choose the amount of liquid you use depending on how thick you like your shake. Yum! This really hit the spot. I’d been craving this shake all week :). Well, I hope you all have a great day… I should probably go wake Marco up… it’s nearing 8:30 AM and I know he’d want to be up… I’ll see you back here tomorrow :).